Lahore has always been known as a warm, hospitable and entertaining city for centuries. 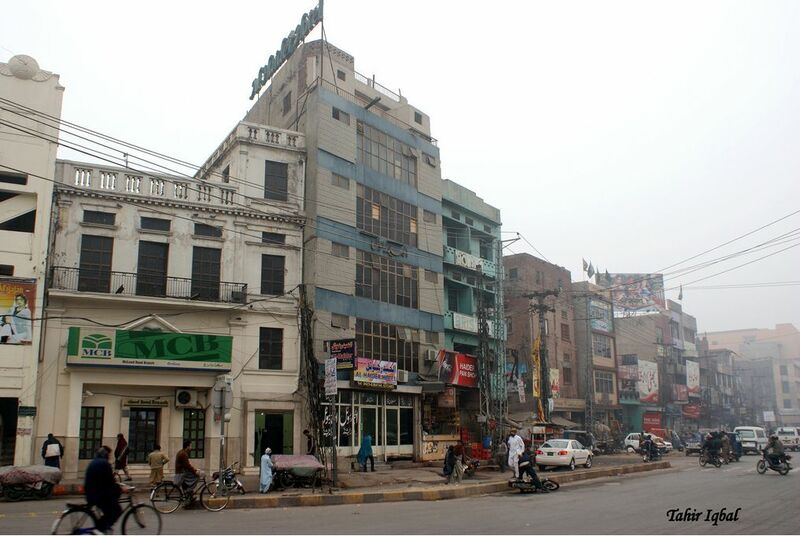 Although, Lahore thrives and throbs in its every nook and corner, Lakshmi Chowk, situated on the cross roads of McLeod Road, Nisbat Road and Abbott Road, is one such place in Lahore which has not one but many facets that make it the heart of Lahore. The place draws its name from the presence of the doubled storied Lakshmi Building [photo below], which is situated right on the cross roads as seen on the map above. 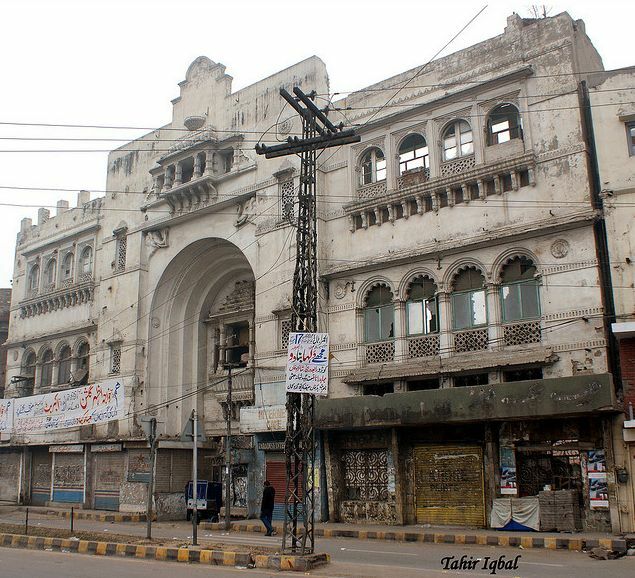 I know Lakshmi Chowk very intimately, as for years I rode past the place in the double deckers of the Lahore Omnibus Service (LOS) during my school days. 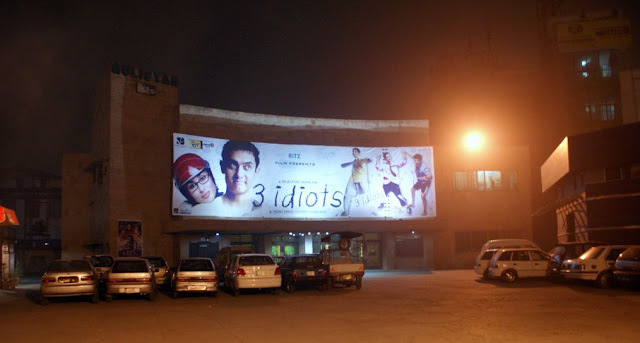 Since my house was located nearby on the McLeod Road, I also footed the place when going to watch a film as Abbott Road, an off shoot of McLeod Road from Lakshmi Chowk housed almost a dozen cinemas of Lahore. 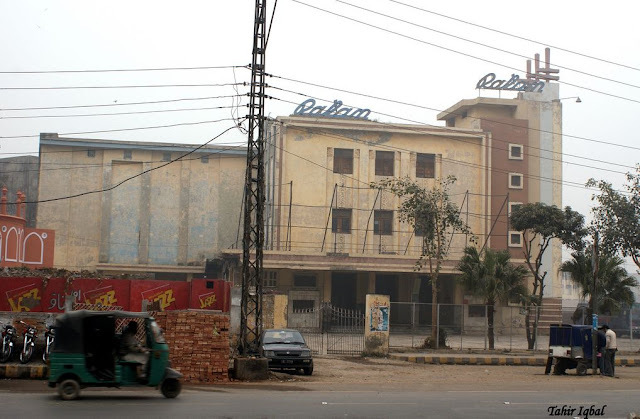 In the early 20th century, when the films as entertaining media came to the then British India, Lahore became to be associated with the making of films as early as 1929 with the opening of the United Players' Studios on Ravi Road. And from then on, Lahore became an important film making centre with its many cinemas and film making studios, which were located in and around Lakshmi Chowk. 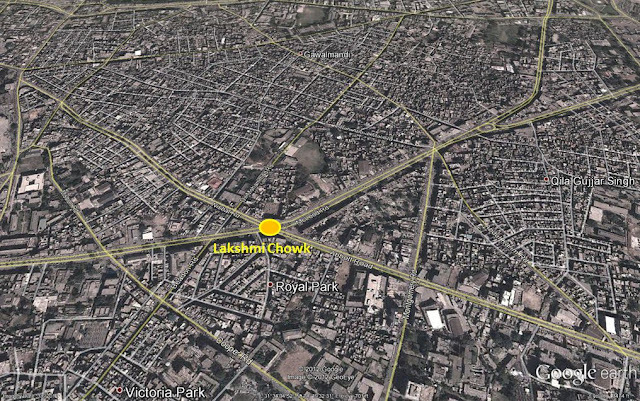 Royal Park (pictured above and below) houses offices of major film distributors and producers of Lahore film industry. 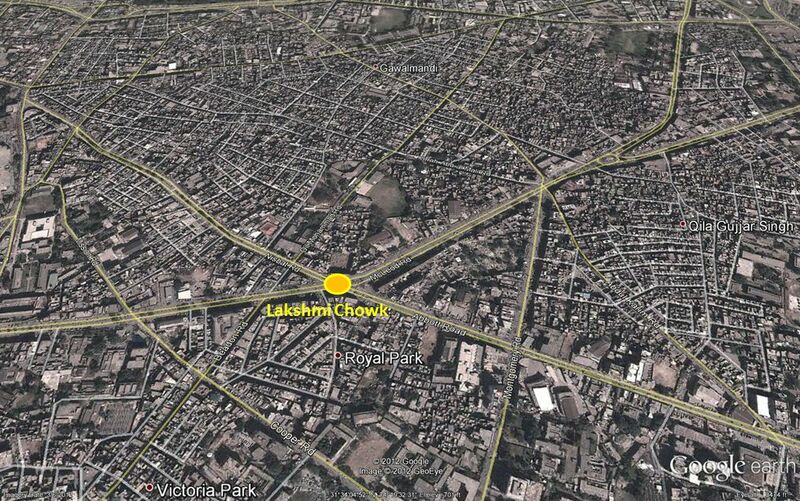 Lakshmi Chowk has always been the focal point of Lahore’s film industry crowd. Even befoe the partition of British India in 1947, Lakshmi Chowk and Royal Park would throng with tongas and cars carrying film stars, film directors and producers in the evenings. Indian superstars Pran, Muhammad Rafi, Om Parkash, Balraj Sani, Dev Anand and many less known artistes started their film careers from Lahore. Lakshmi Chowk was the hot spot for formal and informal film gatherings.All these actors later migrated to India in 1947. Om Parkash who lived at Matti Chowk, Lohari Gate, always rented out a decorated tonga to Lakshmi Chowk every day. Pran lived in Qilla Gujjar Singh, half a kilometre away from Lakshmi Chowk. One day while standing at a pan shop in Lakshmi Chowk, he was picked up by Wali, a leading film director of the time, and offered him a role in his films. Wali wrote the address of Pancholi Studios (one of the most famous film studios of Lahore in Muslim Town) on the back of a cigarette pack, which brought Pran to the film industry. There also was a hotel called King Circle at Lakshmi Chowk where film stars gathered. A bank has taken its place these days. I also have a long association with one once famous Aznic Studio, located just off the Lakshmi Chowk in the Royal Park on Abbott Road as seen in the photo above, which was our family photographer and many of our family portraits were shot by Aznic Studio. The Aznic Studio was the venue on 1 November 1967 when we five brothers accompanied by our parents had our group photograph on the eve of 25th wedding anniversary of our parent. This year if my parents were alive, they would have been celebrating their 75 wedding anniversary - but their life did not give them more time than what they had when they died in late 90s. Rattan Cinema located just off the Lakshmi Chowk was once a thriving cinema of the area. Initially named Balwanti Rai Theater in the pre-partition days as seen below, the cinema screened some of the best films of the time. 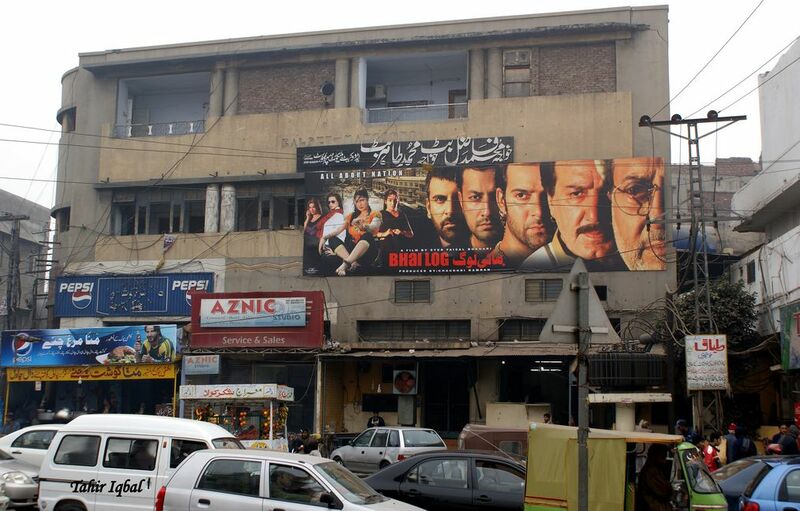 However, the almost demise of Lollywood has forced the closure of the cinema and now it awaits some buyer to convert into a commercial centre or to be used as stage shows. As I said before, almost a dozen cinemas were once located in the vicinity of the Lakshmi Chowk, mainly on the Abbott Road. I saw these cinemas mushrooming from my childhood. 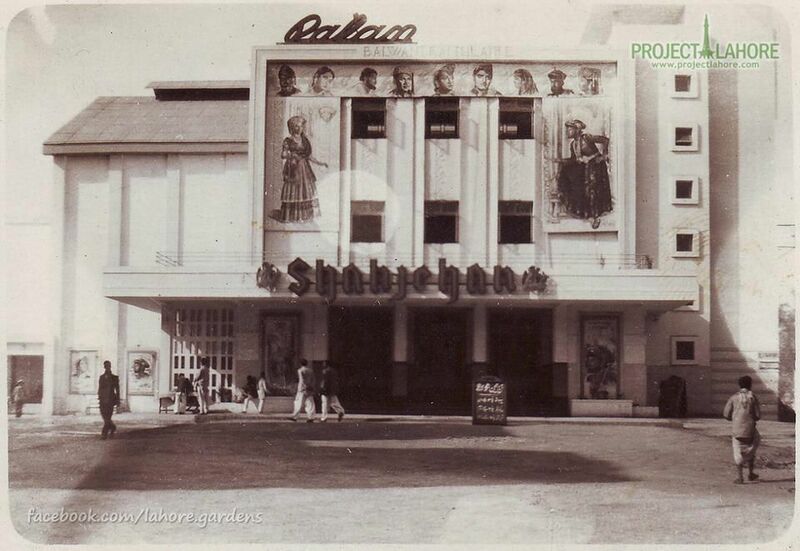 Some of the pre-partition cinemas included Rattan, Odeon, Nishat and one more (I have forgotten the name). Odeon cinema screened some of the best English films of the time, but later it started screening local films before being turned into a hotel. The place where Gulistan cinema stands today housed a dilapidated building with lot of wild growth around it. In fact turning left from the intersection of Abbott and Montgomery Roads, it was a Dracula's place before Gulistan cinema ushered in a line of new cinemas. We five brothers when passing through the place would walk a little faster en route to watch a movie at Plaza cinema, lest Dracula came out of the haunted building and grab one of us.